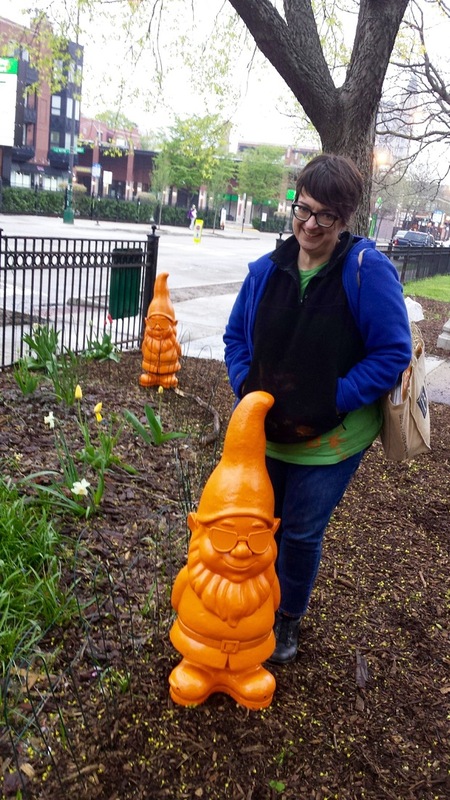 Gnomes have been installed in Wicker Park for Arbor Day awareness. 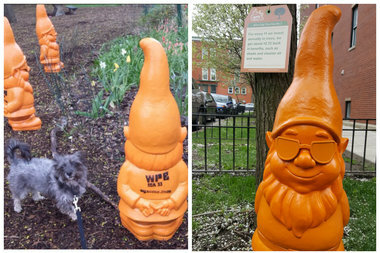 WICKER PARK — An army of mischievous orange gnomes have descended upon Wicker Park and Bucktown to draw attention to Friday's national Arbor Day holiday and a taxpayer-funded group's efforts to invest in neighborhood trees. The 84 gnomes, spray-painted bright orange, are sponsored by the Wicker Park Bucktown Special Service Area Taxpayer District No. 33., which levies a special tax on property owners for communal services like street cleaning and snow removal. The gnomes will stick around until Mother's Day weekend. After May 8, business owners in the commercial district are encouraged to "adopt a gnome." A stamp on the back of each gnome directs to a website, ognome.com, to learn more about the 3-foot-tall visitors, who are joined by over 500 oversized "tree tags" that educate residents about "the positive impact of urban trees on the business district and community as well as to heighten awareness and respect for the urban environment," according to a news release. The Wicker Park Bucktown Chamber of Commerce has an ongoing tree management plan for the 1,700 trees within the commercial district. Around 7 a.m. Friday, Beth Sholtis, assistant program manager for the Wicker Park Bucktown Chamber of Commerce, was preparing to place tags on trees in the park, 1425 N. Damen Ave.
Sholtis said she had started her day at 4 a.m. along with volunteer commissioners from the Special Service Area No. 33, who were deployed all over the area to install the tree tags.